Unless you’re au fait with the planning system and land markets you should seek professional help in maximising land value. I wouldn’t re-wire my house, or carry out medical procedures that’s what experts are for! However, I am fortunate to have worked in both planning and land and appreciate the expertise required for the creation and maximising of value through the planning and land process. In the first instance, I would recommend a development appraisal for the site which is a good way to ascertain development potential, these appraisals generally consider the planning policy position, local circumstances, planning history and recommend a clear planning strategy to achieve the sites planning potential. Whilst Planning House can advise on a site’s planning potential through a development appraisal engaging with the relevant local planning authority is a good way of gauging the informal views on your proposal, you do not need to have detailed plans drawn up at this stage. There are many benefits of seeking pre-application advice as well as potentially saving you money in abortive professional fees if development is not feasible. These discussions can flush out any site specific issues and potentially speed up the decision making process. However, be aware local authorities sometimes charge for these discussions. I would recommend that anyone who wants to maximise land value to speak to a land agent, who are different to estate agents as they specialise in sourcing and disposing of land taking into account build costs and constraints of the site, they can advise initially on existing values and offer guidance in terms of potential values should planning permission be secured. However, a site with development potential will only realise its value once planning permission has been secured. A site marketed as development potential’ will not achieve its true value as this is speculatively based on hope value’. Some people assume that if a site has development potential its existing value can be inflated without securing planning permission, which is why one of the issues faced by land agents is vendor expectation. Whilst land is an asset the value of it must be offset by the costs of the development itself this will ultimately affect land value, for a development to be realistic it must be viable. The cost, timescale and resources needed for a planning application depend on the site and proposal. In some cases, it may not be prudent to secure planning consent yourself when weighed against the cost of the planning process, timescales and particulars of your site, however this is very much dependant on the existing and potential difference in value, scale of the site and personal circumstance. Land agents can explore options with you such as land assembly, overage clauses, promotional and option agreements. They will also take into account any covenants, existing tenant or access issues the site may have. 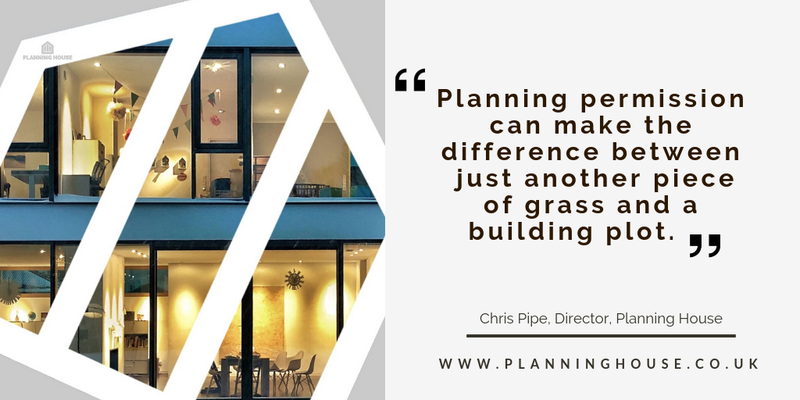 In a nutshell planning permission generally increases land value when there is potential for a viable development, however realising the value must be weighed against the investment needed and timescale to achieve it. If you have a potential development site and are looking to maximise land value contact Planning House to discuss how we can help.